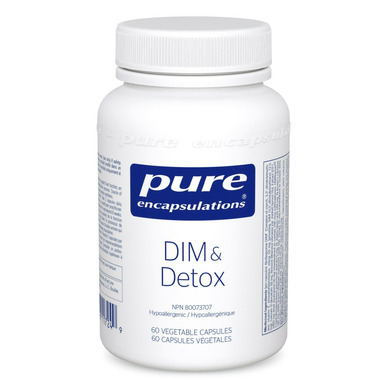 Pure Encapsulations' DIM & Detox offers support for antioxidant defense and function of the liver, an organ essential to the body’s detoxification. DIM & Detox offers support for antioxidant defence and function of the liver, an organ essential to the body’s detoxification. BioResponse DIM® provides 25 mg per serving of a highly absorbable form of DIM, an important metabolite of indole-3-carbinol. DIM supports the expression of antioxidant and phase II detoxifying enzymes, which protect tissues from oxidative stress, toxins and reactive substances. Alpha lipoic acid and N-acetyl-L-cysteine (NAC) also provide antioxidants for cellular protection and act to support phase II detoxification enzyme activity in the liver. l-Methionine is an essential amino acid that supports glutathione production and encourages healthy liver function, including phase II detoxification pathways, healthy hepatic fat metabolism, and bile flow. The amino acid taurine is also present in liver cells as an important component of bile acids, which aid in the absorption of fat-soluble vitamins.